A powder extracted from plants could prevent carbon dioxide (CO2) from reaching the atmosphere. CO2 is humanity’s primary greenhouse gas emission, and it’s wreaking havoc on our planet. While we’ll need to dramatically decrease the amount of CO2 we produce to address our climate issues, transitioning to clean sources of energy is going to take some time. In the interim, some suggest we capture the CO2 we produce so it can’t reach the atmosphere. Now, a team from the University of Waterloo has just figured out how to almost double the efficiency of one CO2-capture method. When CO2 comes in contact with carbon, it sticks to it due to a natural phenomenon known as adsorption. 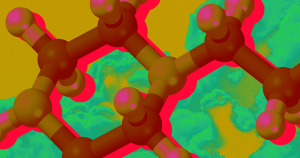 This makes carbon a promising material for CO2 capture, and in a paper published in the journal Carbon, the Waterloo team describes a carbon powder twice as efficient at capturing CO2 as conventional materials. Using a specially developed technique involving heat and salt, the researchers extracted a carbon powder from plant matter. Because most of the spheres of carbon that comprise the powder are very small — less than one-millionth of a meter in diameter — with very porous, the powder is particularly efficient at capturing any CO2 it comes in contact with. The idea is that facilities that produce significant amounts of CO2 — through the burning of fossil fuels, for example — could use this powder to capture that CO2 and then ship it somewhere for storage, perhaps underground. While the best way to prevent greenhouse gas emissions from reaching the atmosphere is to not produce them at all, CO2 capture could be a worthwhile stopgap measure. As noted in a University of Waterloo press release, carbon extracted from plant matter is plentiful, cheap, and environmentally friendly. So a carbon that’s super efficient at capturing CO2 could be extremely useful as we make the transition to a society powered by clean energy.